Click the images to see larger views. 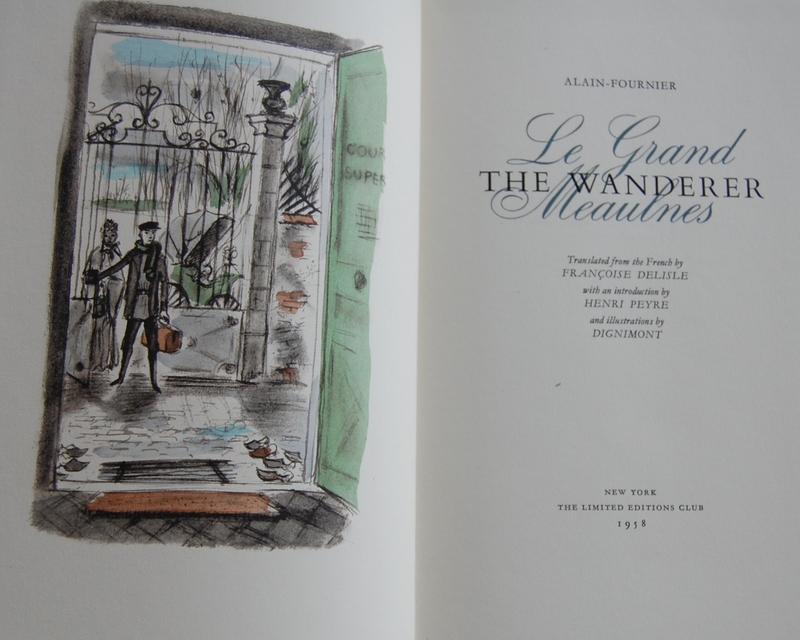 Front Binding – The Wanderer, the lone novel from Alain-Fournier (and the sole offering from either Club) before his early death, is lovingly rendered by the LEC, with a colorful cloth covering the boards. 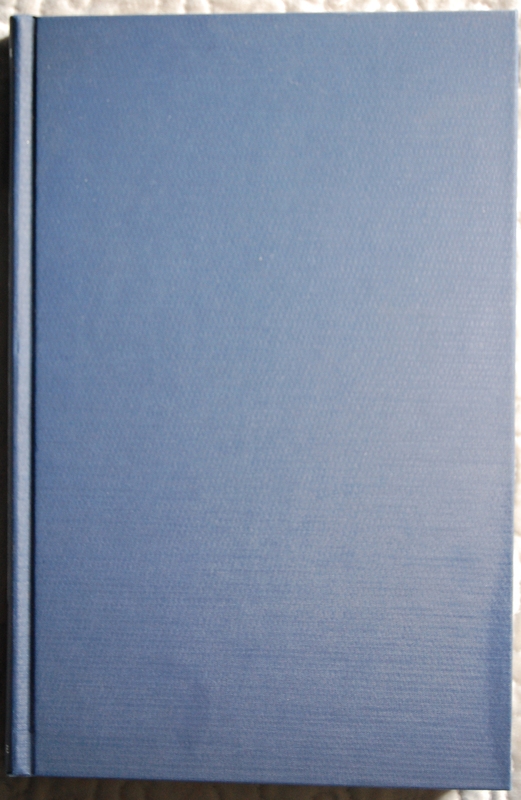 However, from the front, this is not one of the Heritage Press’ more distinguished books, with a sterile blue linen on the boards. The spine is pretty classy, but we’ll get to that. First, a brief primer on author and artist. Alain-Fournier (a pseudonym for Henri-Alban Fournier) was a soldier first before trying his hand at writing; his life was ultimately cut short when he died in 1914 at the age of 27. 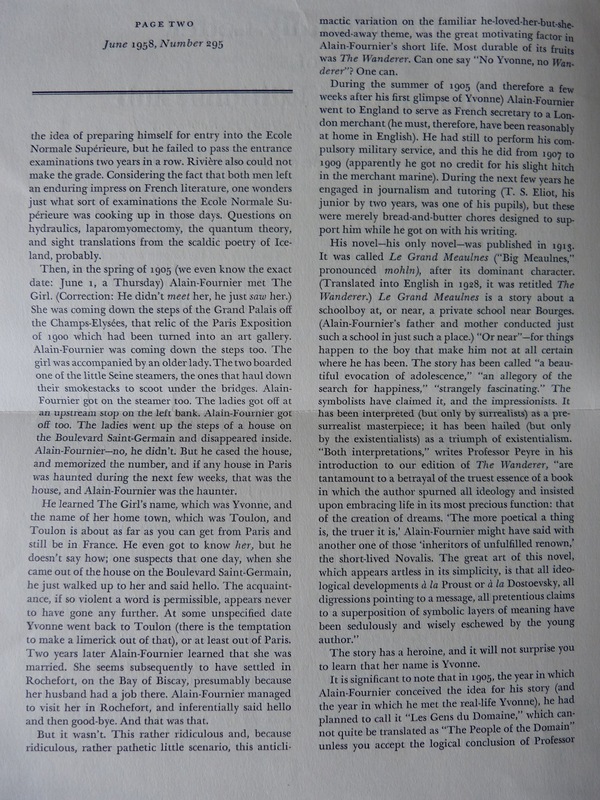 His literary star was beginning to rise after turning to criticism and writing in 1910 following his discharge from the French military, but alas, a return to the Army led to his passing in combat. 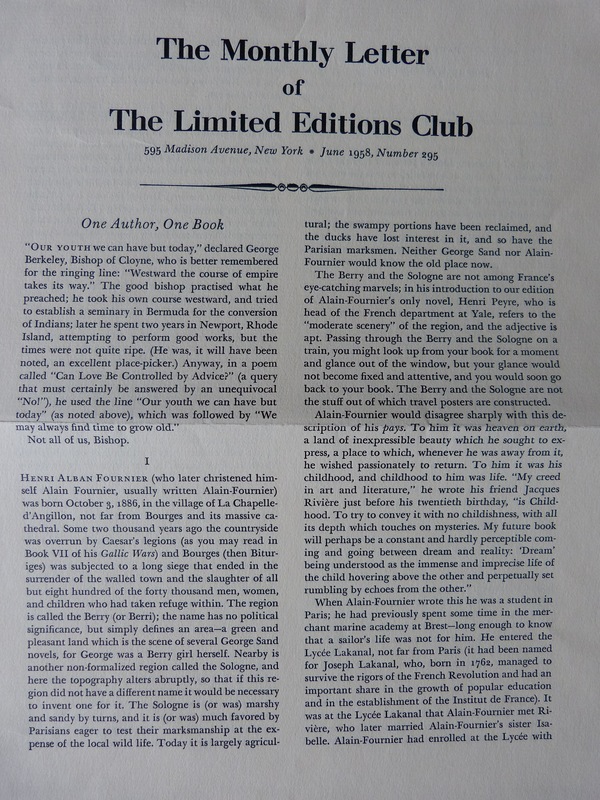 This novel has since become a classic of more contemporary French literature. Dignimont (short for Andre Dignimont) had a brief career with the George Macy Company, beginning here and concluding with Wilkie Collins’ The Moonstone the following year. He passed away in 1965, so perhaps a sudden decline in health is why he ceased working for the Company. 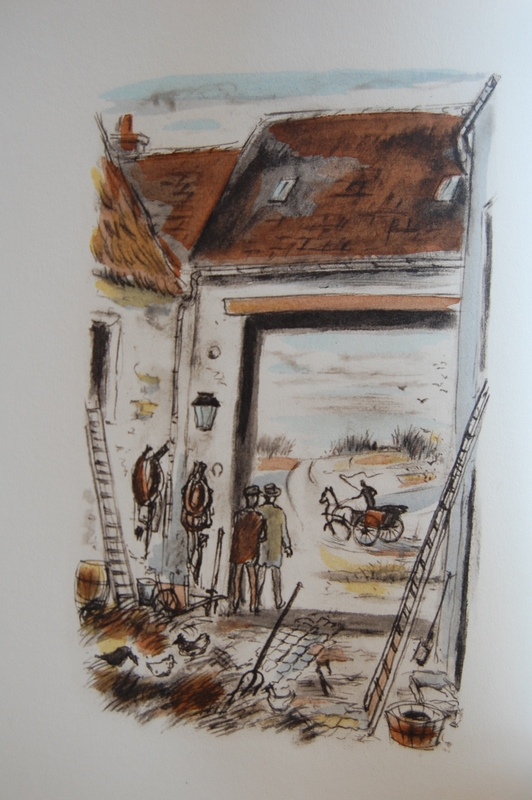 In his native France, he illustrated Colette’s The Vagabonds among others. Jean Garcia, who I also discussed in my post on the Moliere twofer, was responsible for the design of both books, but I have a hunch he had little say in the Heritage one’s binding, considering how barren it is. Both the LEC and Heritage were bound by the Russell-Rutter Company. 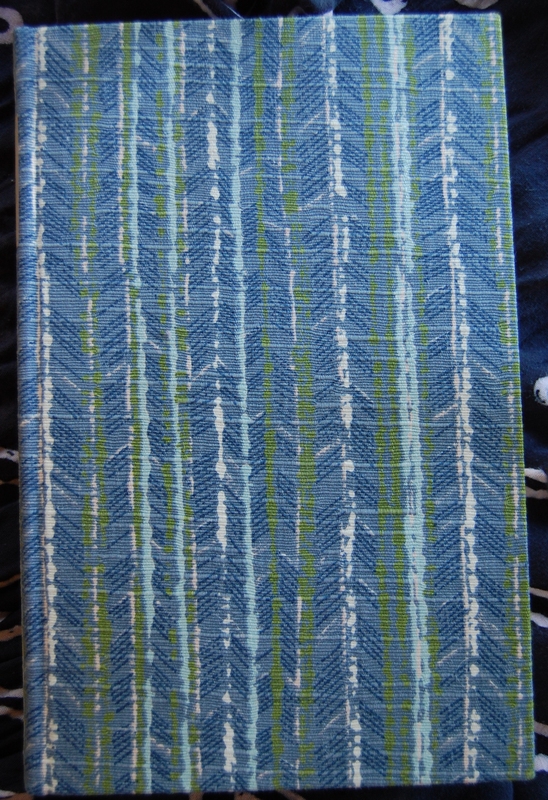 The Heritage book was housed in a silver slipcase; alas, my old copy was lacking that adornment. You can see the LEC slipcase below. Garcia’s choice of font is the popular Garamond, one that still sees plenty of action in our modern computer era. 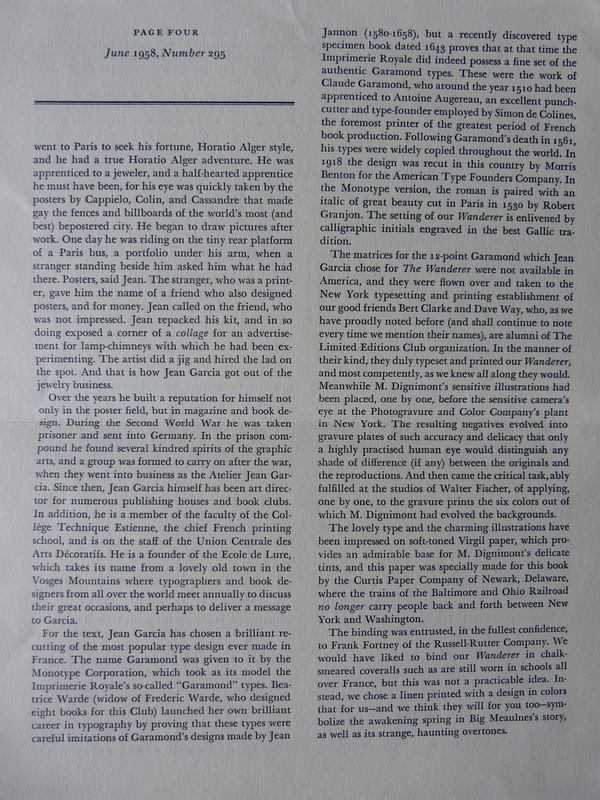 The Thistle Press’ (and George Macy Company alumni) Bert Clarke and Dave Way set the type and printed it for both editions, while Dignimont’s classy pen-and-pencil drawings were reproduced by the Photogravure and Color Company, and then were colored by The Arrow Press for the Heritage, and by William Fischer for the LEC. The Heritage paper, made by Crocker, Burbank of Fitchberg, Massachusetts, is of a Hermes Eggshell Natural White tone. 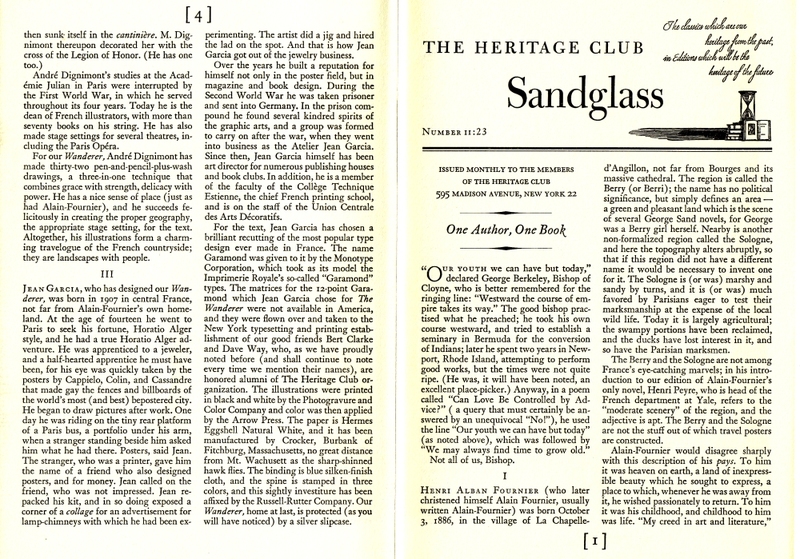 The LEC, meanwhile, has Virgil paper specially made for its edition by the Curtis Paper Company. Having not read this yet, I can’t say for certain if Dignimont was an ideal fit, but I do like his style. 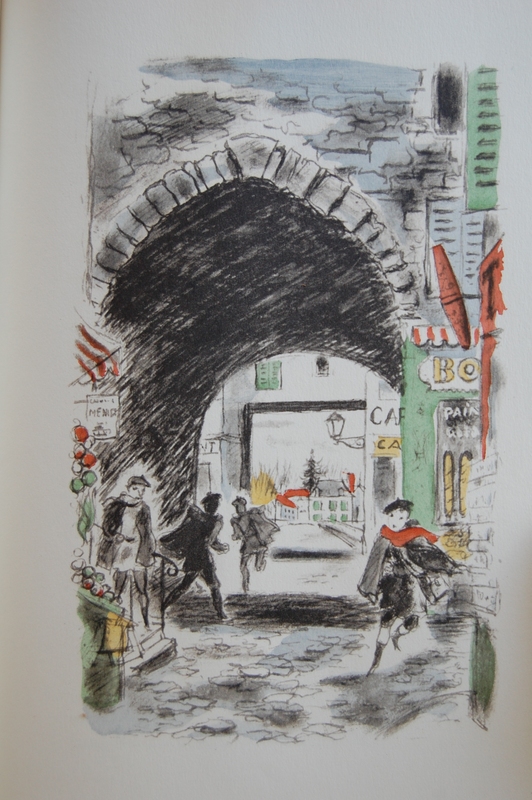 The drawings employ a three-in-one technique of pen, pencil and wash, that the Sandglass says “combines grace with strength, delicacy with power”. 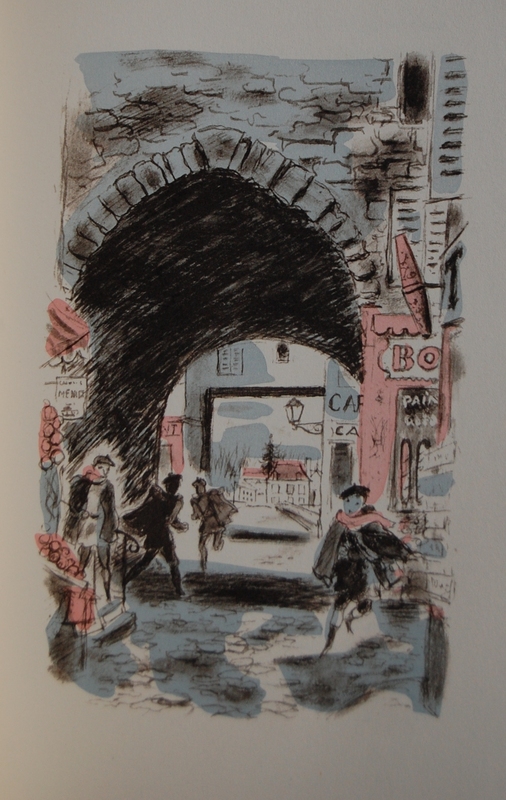 The book is also similar to designer Garcia’s later treatment of the LEC and Heritage editions of Tartuffe and The Would-Be Gentleman in that the illustrations are not colored as vibrantly in the Heritage edition compared to its LEC original. Dignimont’s pen-pencil-wash drawings are lusciously colored, but the Heritage reprints are much more restrained in color choice, as you’ll see. Spine – The majority of the Heritage edition’s class comes from its spine, stamped in three colors. It reads Heritage on the bottom, which my camera did not catch. Wish this was on the front, too…and while I’m wishing, I must say I prefer this over the LEC design by a long shot…so I wish it was on my LEC, too. Ah well. Title Page – Here’s the first example of our illustration coloring. The LEC utilizes more than two colors, and look far more lush than the more limited palette of the Heritage. 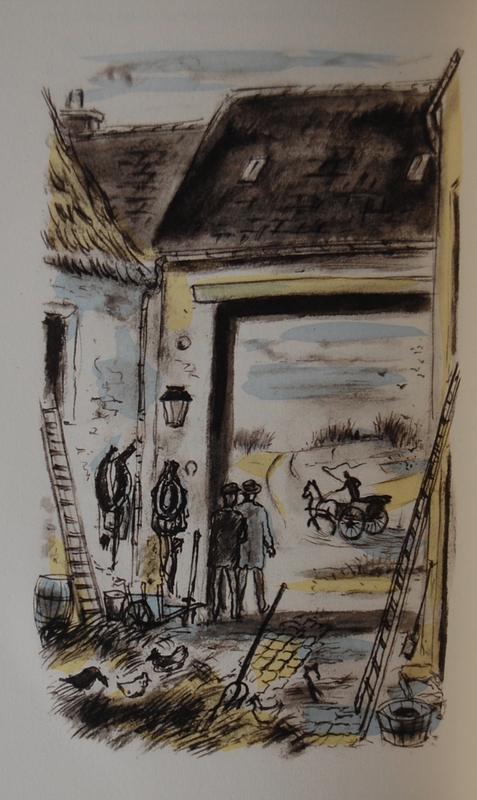 This alone makes the LEC worth it, as Dignimont’s art benefits greatly from the richer variety. 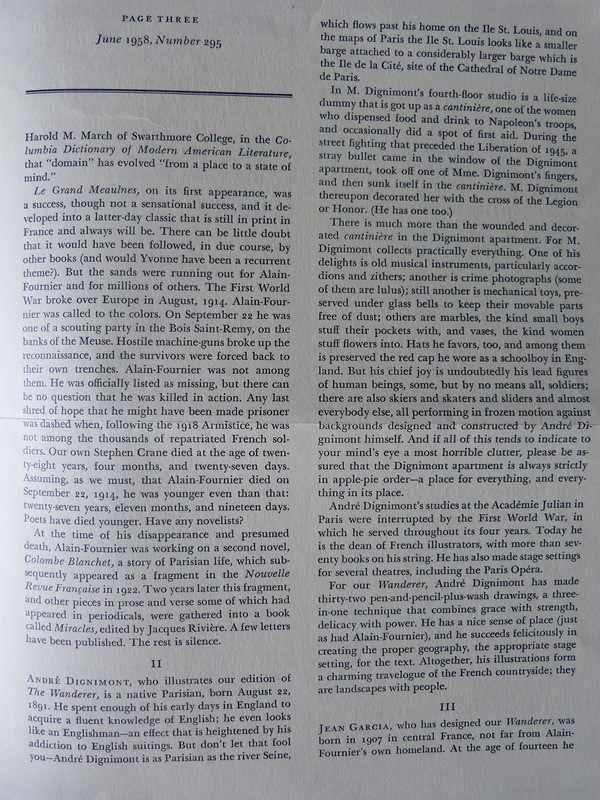 The text was translated by Francoise Delisle and introduced by Henri Peyre. 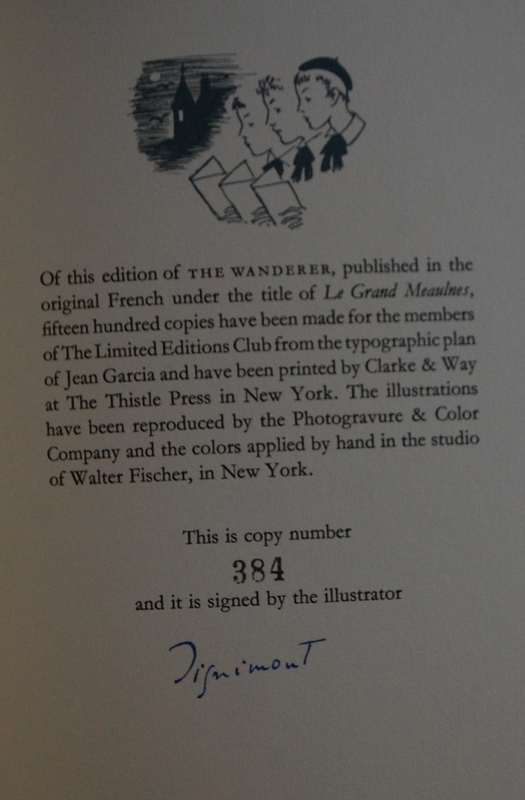 Signature Page – This copy was #384 of 1500, and Dignimont provides his signature. Page 12 – I do like the vibe of this one. It has a sense of urgency despite there being a relatively barren street. The LEC, as par the course here, is even more amazing. 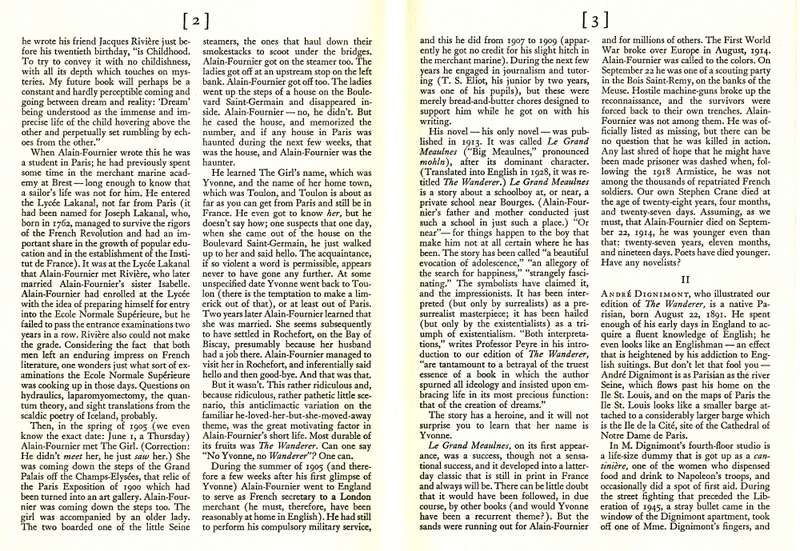 Page 17 – Other colors were used for the Heritage than blue and pink; yellow shows its face, too, as you can see here, as well as green. Most use two shades of color to decorate Dignimont’s lines, but there’s at least one that uses three. Still, it pales to the LEC;s much broader palette. Personal Notes – I got the Heritage first from my dear friend Lois Wheeler’s Page One Used Books in Mariposa for volunteering before she closed up her shop. The LEC was a swap with Django6924 in exchange for two other books I didn’t want to keep, and I’m very happy with the switch. Thanks again! 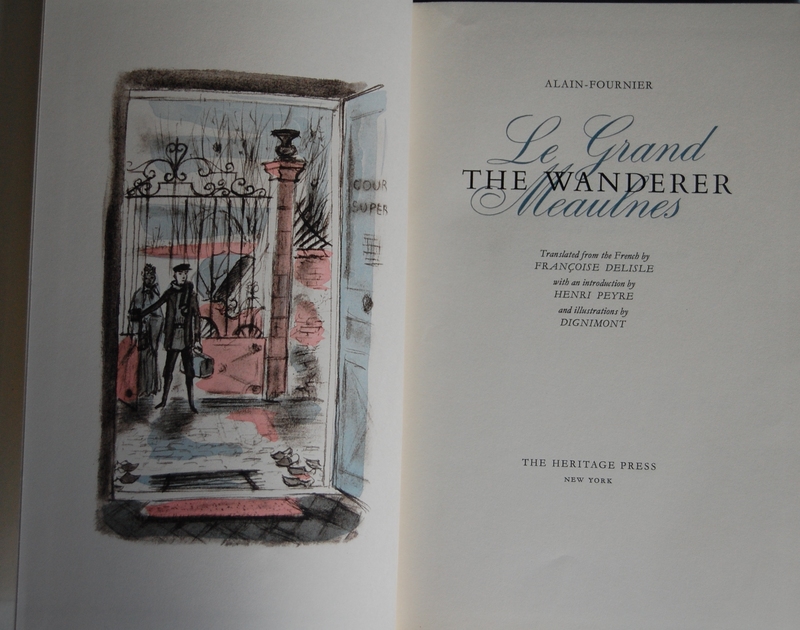 You are currently reading Limited Editions Club: The Wanderer/Le Grand Meaulnes by Alain-Fournier (1958) at The George Macy Imagery.